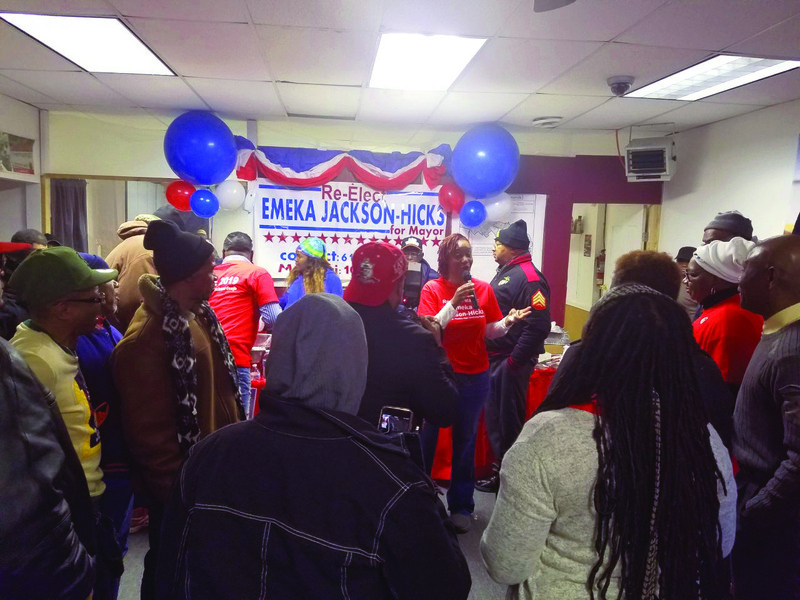 “Promises made promises kept,” was the theme as Mayor Emeka Jackson-Hicks officially launched her campaign for a second term at the helm of the City of East St. Louis, with a Jan. 19 rally. Jackson-Hicks, the city’s mayor since 2015, cites strengthened relationships with a range of partner organizations — from powerful St. Louis business groups to local neighborhood organizations — as a theme of her administration. “The time has gone by very fast. We have been working diligently to pour a strong foundation for the City of East St. Louis that will afford us the opportunity to finally build together,” Jackson-Hicks told the crowd during the combination rally, chili cook-off, and apparel-and-care-package giveaway. Under her administration, East St. Louis has seen a 42 percent reduction in homicides; hired new police officers for the first time in five years; repaired and replaced lights along the city’s major corridors; and resurfaced over 100 streets, Jackson Hicks told the crowd. The U.S. Department of Treasury has designated five Opportunity Zones to promote economic development in the city, Jackson-Hicks continued. Numerous derelict and abandoned structures, as well as unsafe wooded areas, have been cleared, Jackson-Hicks continued. Some $500.000 in TIF funding has been used to create a $2 million loan fund for expansion of existing East St. Louis businesses. Ameren Illinois, following negotiations with the city, has agreed to keep open their 25,000 square foot East St. Louis facility. “We are not an island. As a result of developing strong relationships throughout the region, East St. Louis is now in a strategic position to grow. My work to grow relationships has been very intentional and necessary. I am asking the citizens to continue the progress under my leadership,” she concluded. 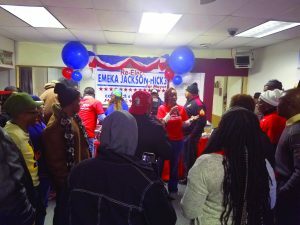 Joining Jackson-Hicks on the April 2 municipal election ballot will be former East St. Louis mayor Carl E. Officer, City Councilman Robert Eastern III and activist Darnell Thompson. Officer announced last May that he would seek what-would-be his fifth term as East St. Louis mayor. The vice-president of Officer Funeral Home, Officer has nearly 40 years in East St. Louis public life. With his first election to the East St. Louis chief executive’s office in 1979, Officer, then 27, became the youngest mayor in America. He is a former board member of the East St. Louis School District 189 and in 2016 ran for county coroner under the Freedom Coalition banner. He, last year, supported an effort to change East St. Louis from a city manager to a mayoral form of government. Eastern’s current term on the council expires in 2021. In September, Eastern — with the help of politically influential attorney Robert Sprague — successfully challenged in court a ballot issue to adopt mayoral government. In 2016, he voted to retain then-recently defeated Mayor Alvin Parks as city manager, but then, a few days later, reversed positions to vote with Jackson-Hicks to oust Parks. Thompson Is a consultant who provides in-kind work to the city as a municipal planner. He has run for the mayor’s office twice previously, in 2011— when he won the Democratic primary and in 1991 when he lost in the primary. Long-time St. Clair County State’s Attorney Brendan Kelly has been nominated by new Gov. J.B. Pritzker to become the new head of the Illinois State Police. 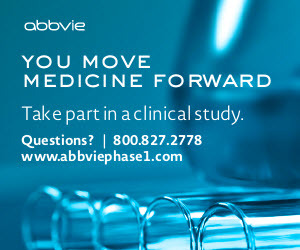 The nomination is subject to confirmation by the Illinois Senate. However, apparently confident of confirmation, Kelly stepped down as state’s attorney, Jan. 23, after serving in that position since 2010. Kelly has a history of working closely with state police on corruption investigations and drug cases. In a statement following his Jan. 22 nomination remarked: “there’s nothing more important for government” than justice and public safety. 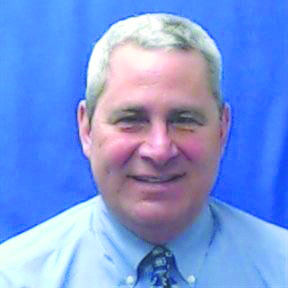 St. Clair Board Chairman Mark Kern has appointed Belleville attorney James Gomric as the county’s new state’s attorney. Kelly was the Democratic candidate for Illinois’ 12th Congressional District in the U.S. House, during the Nov. 6, 2018 general election, but lost to the district’s Republican incumbent, U.S. Rep. Mike Bost. As state’s attorney, Kelly has established a special violent crime unit, for prosecution of the most serious cases, and the Tracy Fogarty Domestic Violence Unit, under which domestic violence prosecutions have tripled. A former school board member, he also has established the St. Clair County Juvenile Justice Council and Children’s Justice Division; closely with school districts to fight parent-caused truancy. Kelly has also established the Special Prosecutions Division and quadrupled the number of public corruption cases handled by the office. Metro Transit general manager Scott Grott has been named the transit system’s interim chief of security, according to Taulby Roach, the new president and CEO the Bi-State Development Agency – Metro’s parent entity. Grott replaces former security chief Richard Zott. Also leaving the top echelons of the Metro Link security department is assistant security chief Jason Davis. Grott will maintain his responsibilities as general manager, while Bi-State searches for a permanent security chief, agency officials said. The personnel changes took effective Jan. 19. Bi-State has come under criticism for a series of violent incidents on or around the agency’s Metro Link light rail trains and boarding platforms, including those in Fairview Heights and Washington Park. Ridership on Metro trains and buses decreased 11 percent during Bi-State’s most recent fiscal year, ended June 30, 2018. Commonly blamed for drop in ridership is lack of on-board security guards, turnstiles or barriers to keep out unauthorized riders, or even fences around Metro Link tracks and stations. St. Louis County is withholding a portion of its annual funding for transit line until security improves. Metro maintains its own contingent of security officers and also contracts with private security firms. However, in what is believed to be the first-ever authorization of out-of-state law enforcement person to provide security in Missouri, the St. Clair County Sheriff’s Department is now providing supplemental security on Metro Link trains along with police from the City of St. Louis and St. Louis County. Roach, the former chief financial officer of the St. Clair County Transit District became president and CEO of Bi-State on New Year’s Day; promising changes at the oft-criticized and financially troubled agency. Grott has been with Bi-State since September 2002 and has been Metro Link general manager since January 2017. His entire career has been in the railroad industry. He holds a bachelor’s degree in electrical engineering technology from Southern Illinois University, Carbondale (1986) and an associate degree in electronics technology from Southwestern Illinois College (1984). Zott had been Metro’s public safety chief since 2012. Bi-State spokespersonas have not disclosed whether Zott or Davis are still with the agency. The New York-based consulting firm WSP USA Inc., is expected to submit a report on improving Bi-State security to the East-West Gateway Council of Governments in February. Southern Illinois University Edwardsville (SIUE) students had the opportunity to learn about both the products and services offered by local businesses and volunteer opportunities with area non-profit organizations during the Cougar Fest: Merchant and Volunteer Fair, Jan. 22. 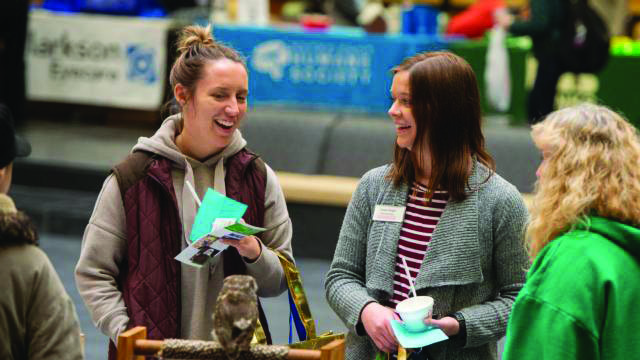 With entertainment, giveaways and prize drawings, Cougar Fest is designed to offer a break for students between classes. However, many students take time to talk with representatives of the numerous non-profits and businesses with exhibits on-site.